Gallopade has created the Nebraska Decorative Set to make shopping easier for you AND at a fantastic price! The Nebraska Decorative Set has six decorative products including bulletin boards, borders, nameplates, a map, a big timeline, and a poster. Perfect for decorating your walls, windows, hallways, doors and more. Great for the classroom, home or office. Brighten your classroom and teach students about their state with Nebraska Borders for Bulletin Boards! The Nebraska Borders feature the Nebraska official state tree, bird, flag, seal, and other symbols. Borders are 3” wide and 32' in total length. Students can learn the state tree, bird, flag, seal, and other symbols of Nebraska right at their desk! State-specific nameplates will add pizzazz to your classroom decor and make learning about Nebraska fun! Decorate your walls with this 11” x 17” Nebraska Flag Poster. The Nebraska Flag Poster is printed on high quality, heavy, gloss card stock with a full bleed and ready to be framed. Gallopade has created the Nevada Decorative Set to make shopping easier for you AND at a fantastic price! 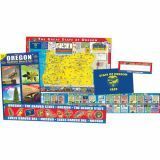 The Nevada Decorative Set has six decorative products including bulletin boards, borders, nameplates, a map, a big timeline, and a poster. Perfect for decorating your walls, windows, hallways, doors and more. Great for the classroom, home or office. 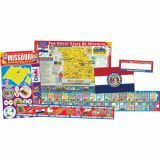 Brighten your classroom and teach students about their state with Nevada Borders for Bulletin Boards! The Nevada Borders feature the Nevada official state tree, bird, flag, seal, and other symbols. Borders are 3” wide and 32' in total length. Students can learn the state tree, bird, flag, seal, and other symbols of Nevada right at their desk! State-specific nameplates will add pizzazz to your classroom decor and make learning about Nevada fun! Decorate your walls with this 11” x 17” Nevada Flag Poster. The Nevada Flag Poster is printed on high quality, heavy, gloss card stock with a full bleed and ready to be framed. Gallopade has created the New Jersey Decorative Set to make shopping easier for you AND at a fantastic price! The New Jersey Decorative Set has six decorative products including bulletin boards, borders, nameplates, a map, a big timeline, and a poster. Perfect for decorating your walls, windows, hallways, doors and more. Great for the classroom, home or office. Brighten your classroom and teach students about their state with New Jersey Borders for Bulletin Boards! The New Jersey Borders feature the New Jersey official state tree, bird, flag, seal, and other symbols. Borders are 3” wide and 32' in total length. Students can learn the state tree, bird, flag, seal, and other symbols of New Jersey right at their desk! State-specific nameplates will add pizzazz to your classroom decor and make learning about New Jersey fun! Decorate your walls with this 11” x 17” New Jersey Flag Poster. The New Jersey Flag Poster is printed on high quality, heavy, gloss card stock with a full bleed and ready to be framed. Gallopade has created the New Mexico Decorative Set to make shopping easier for you AND at a fantastic price! The New Mexico Decorative Set has six decorative products including bulletin boards, borders, nameplates, a map, a big timeline, and a poster. Perfect for decorating your walls, windows, hallways, doors and more. Great for the classroom, home or office. Brighten your classroom and teach students about their state with New Mexico Borders for Bulletin Boards! The New Mexico Borders feature the New Mexico official state tree, bird, flag, seal, and other symbols. Borders are 3” wide and 32' in total length. Students can learn the state tree, bird, flag, seal, and other symbols of New Mexico right at their desk! State-specific nameplates will add pizzazz to your classroom decor and make learning about New Mexico fun! Decorate your walls with this 11” x 17” New Mexico Flag Poster. The New Mexico Flag Poster is printed on high quality, heavy, gloss card stock with a full bleed and ready to be framed. Gallopade has created the North Dakota Decorative Set to make shopping easier for you AND at a fantastic price! 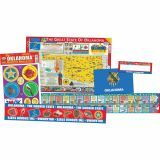 The North Dakota Decorative Set has six decorative products including bulletin boards, borders, nameplates, a map, a big timeline, and a poster. Perfect for decorating your walls, windows, hallways, doors and more. Great for the classroom, home or office. Brighten your classroom and teach students about their state with North Dakota Borders for Bulletin Boards! The North Dakota Borders feature the North Dakota official state tree, bird, flag, seal, and other symbols. Borders are 3” wide and 32' in total length. Students can learn the state tree, bird, flag, seal, and other symbols of North Dakota right at their desk! State-specific nameplates will add pizzazz to your classroom decor and make learning about North Dakota fun! Decorate your walls with this 11” x 17” North Dakota Flag Poster. The North Dakota Flag Poster is printed on high quality, heavy, gloss card stock with a full bleed and ready to be framed.